Took a non-stop Alaska Airlines flight from LAX to Loreto Mexico for a celebration of spa and wellness that included original mock cocktails and personalized menus of vegan, vegetarian and gluten free recipes during a Wellness Week Retreat at Villa del Palmar at the Islands of Loreto, a magnificent property that sits majestically overlooking the Sea of Cortez. The focus on healthy eating and drink was orchestrated by food and beverage director Oscar Torres, who designed healthy cocktails, and Executive Chef Alfonso Peregrina and his dedicated team who prepared diet specific culinary delights to enjoy between wellness week activities that included a full schedule of yoga, hiking, kayaking, water sports, exercise programs at the spa, and massage treatments. The elegant green and white Sabila Spa is housed in a seperate building from the hotel, and is an impressive temple of health, crowned with an elegant atrium chandelier as you enter, and offers panoramic views of the exquisite hotel property from the expansive state-of-the-art exercise area. 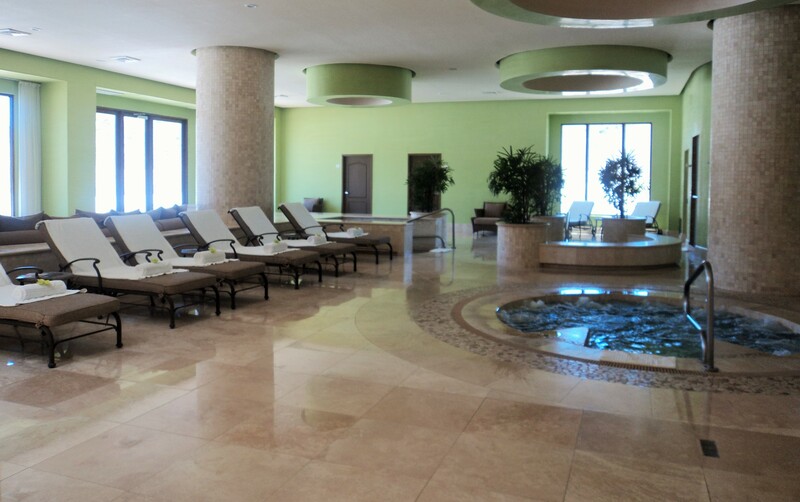 The size of the spa is most impressive, and gives patrons a feeling of relaxation, comfort and space. Lush jacuzzi pools include cold, warm & hot, as well as inviting eucalyptus and lavender baths, plunge showers, saunas, chic steam rooms, and oversized massage and treatment rooms. The comfortable juice lounge in the spa offers refreshing beverages including freshly squeezed juice favorites and the oh-so-delicious 'green drink' of parsley, spinach, celery, orange and pineapple juice that becomes a daily ritual for hotel guests. An adjacent beauty salon within the spa offers all the latest products and services to keep you looking sensational during your stay. Sabila Spa and Wellness director Claudine Riemer is a hands-on professional who personally assists guests with their workout and diet regimen during their stay. 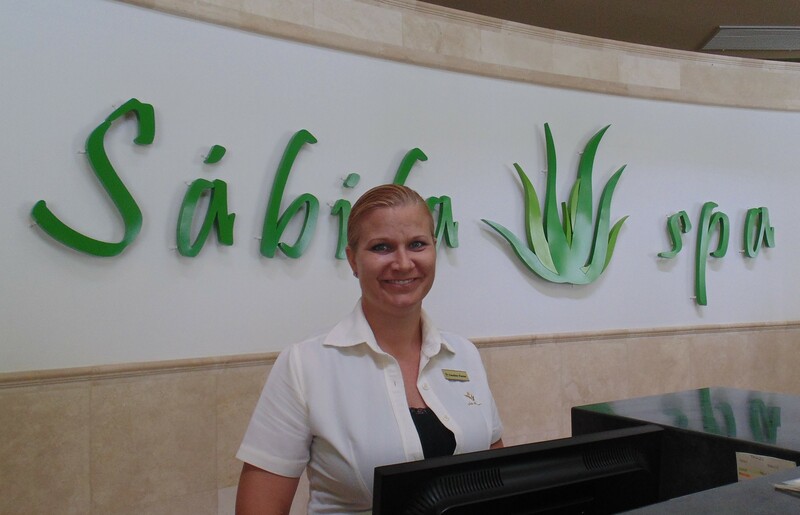 She is very proud of Spa Sabilia's recent selection as number eleven on the Trip Advisor 'Best Spa in Mexico' list. I personally predict this beautiful spa facility will be #1 before the end of the year. According to Riemer, who has a long career managing and designing spa programs �the Wellness Week Retreat at Villa del Palmar at the Islands of Loreto embodies an organic healing process for the mind, body and soul.� The therapists at Sibila are experts who focus on individual body issues, using fine Pevonia products and the latest new treatment aids. The scene stealing hotel pool is in the shape of a turtle, the turtle body being a large main pool, and the feet and head serving as a salt water pool, private guest pool, jacuzzi and a colorful pool for children. The ambiance of the pool is blissful, only interrupted daily by a very entertaining water aerobics instructor. 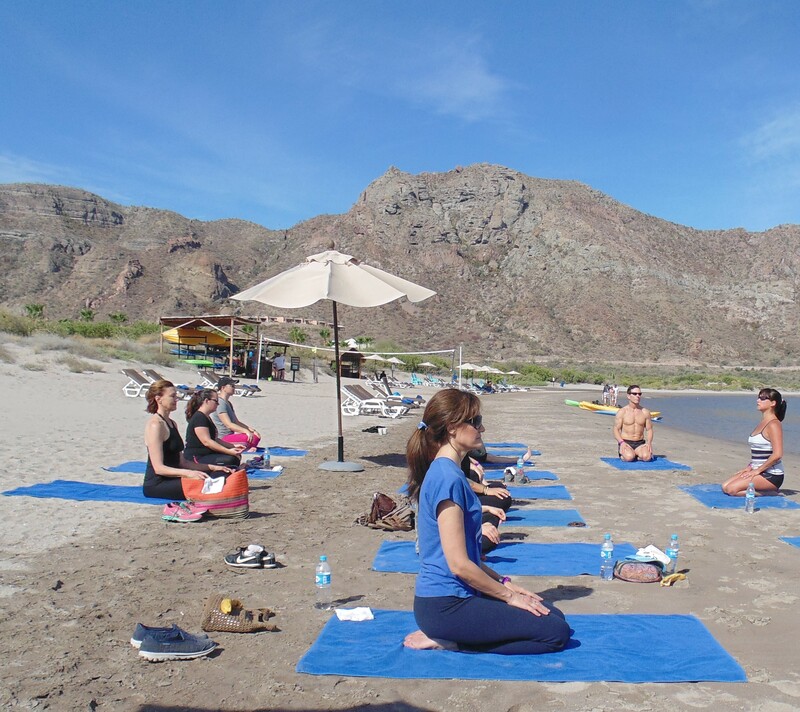 The pristine beach is where Yoga classes are held in the morning and at sunset during the wellness week program, and offers swimming, kayaking, paddle boarding, or just relaxing by the sea, where a bar staff provide cooling refreshments. It is from the beach that snorkelers, scuba divers, and fishermen depart to enjoy the pleasures of the islands in the indigo waters of the Sea of Cortez. The Rees Jones designed Danzante Bay Golf Course is scheduled to open its first nine holes in October or November 2015, and will provide players with food and beverages on the course. �We are working to create a resort where the whole family can enjoy a special vacation to truly experience the beautiful islands of Loreto. We are constantly working to improve our services and provide new offerings for guest enjoyment,� said General Manager Sixto Navarro. It is really impossible to communicate adequately the awesome beauty and feeling of serenity at this property and the surrounding area. The color of the Sea of Cortez is extraordinary as it changes from indigo blue to emerald green, and the sunsets will remain a vision in the mind always. 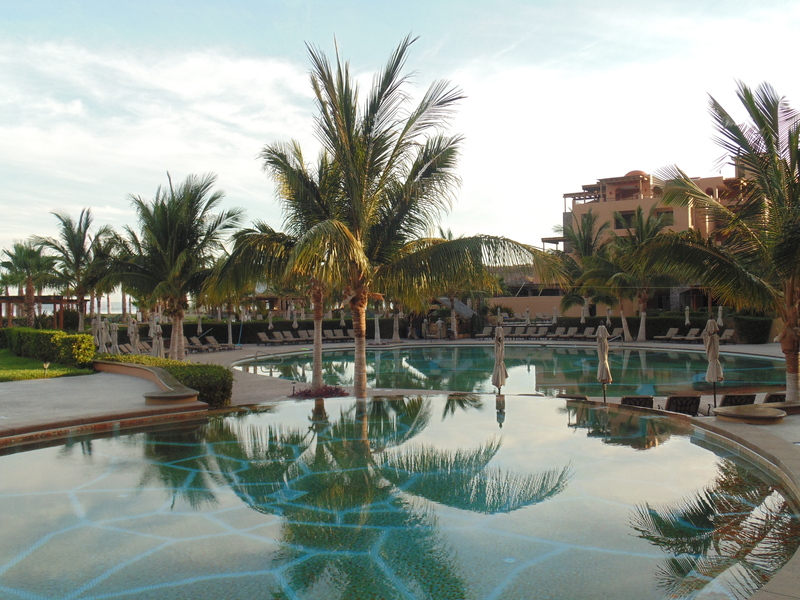 Visiting Villa Del Palmar is a gift to yourself, and a respite to restore your own good health with friends and family. For retreat or reservation information visit their website. Katy Vanek and Paddle Surf Outlet have teamed up to offer Stand Up Paddle Board YOGA, with Sunday classes held weekly beginning at 10:30am. Each SUP YOGA session lasts 1-1/2 to 2 hours and includes a personal SUP Rental, SUP YOGA session and guided instruction for $45 ($25 for those bringing their own SUP). Beginners are welcome, but class sizes are limited, so call Instructor Katy to reserve your spot and for SUP-related questions at 971-235-6995, or Shaun for SUP Board questions at 805-415-7674. Classes meet at Ventura Harbor, 1867 Spinnaker Dr., Ventura, CA. Fantastic new ice cream that everyone will love, with chocolate or fresh fruit it's so delicious. Choct�l, whose home base is located in Pasadena, is known for its gourmet ice creams that feature flavors and beans from different parts of the world, uses ingredients that are sourced from unique regions around the globe and represent only the finest flavors from hand-selected areas. Whether it�s cacao from Ghana or Tahitian vanilla beans from Papua New Guinea, Choct�l is dedicated to allowing ingredients from each country to shine. Currently, Choct�l only offers chocolate and vanilla flavors in order to showcase the true uniqueness of each of their flavor profiles. The ice cream can be purchased on the products website or in select retailers. Dear EarthTalk: What�s the latest with the U.S. Postal Service trying to reduce its environmental footprint? Starting delivery of some mail on Sundays doesn�t seem like a step in the right direction. There are also efforts to reduce the impact of the large fleet of postal delivery trucks. 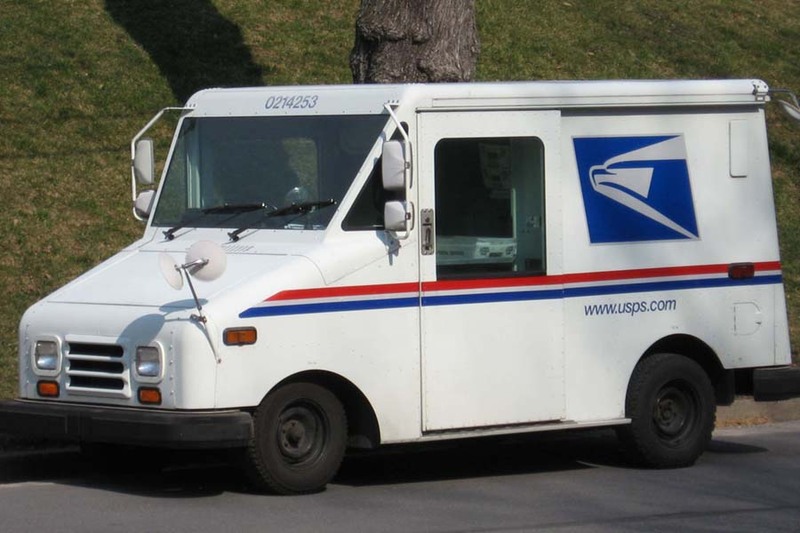 According to the article, �Greener Delivery?� in the Harvard Gazette, the USPS has begun the process of replacing 180,000 of its trucks with more eco-friendly alternatives. The recognizable boxy mail trucks seem to be a thing of the past, as a January proposal suggested several design alterations to enhance efficiency and reduce emissions from the current rate of 9 miles per gallon. In addition to changes to the traditional truck, there are already around 42,000 alternative-fuel vehicles in the USPS fleet, most of them using ethanol as a fuel source. There are also electric, natural gas and bio-diesel trucks. Of course, another way USPS is trying to reduce its environmental impact is to cut out consumers trips�and the emissions entailed�to the post office. Consumers can now print out pre-paid labels to simply attach to packages. By scheduling a pickup from your home, the mailman who passes every day will pick up your package and begin the delivery process. Two other important programs can help reduce consumers� environmental footprint. If you are going out of town, go to USPS.com and put your mail on hold until you return, eliminating unnecessary deliveries to your house. And alerting USPS when you move will also stop extraneous deliveries to your old abode. EarthTalk� is produced by Doug Moss & Roddy Scheer and is a registered trademark of Earth Action Network Inc. View past columns at: www.earthtalk.org. Or e-mail us your question: earthtalk@emagazine.com.